After 80+ years, the boyish reporter-adventurer, Tintin, has finally broken through into American mass culture thanks to the Steven Spielberg movie, The Adventures of Tintin. Almost everywhere outside the U.S., Tintin comic books--synonymous with global adventure and intrigue--have captivated children and their parents for decades. Inside the U.S., however, interest in Tintin and his 23 graphic adventures, deftly rendered by the Belgian author/illustrator, Hergé (George Remi), have been limited to a passionate cult following. With the success of the movie and its promised sequel, that will now change. So expect those books to fly off the shelves of American booksellers. 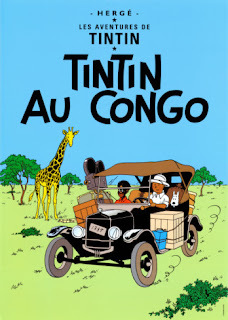 That is, with one exception--the hard-to-get Tintin Au Congo (Tintin in the Congo). In the United States, Congo plays hard to get for a good reason--its gleeful depiction of the natives as lazy, bufoonish, and, of course, clueless in math. (see the illustration below) First serialized in 1930-31 in the Belgian conservative Catholic newspaper supplement for children, Le Petit Vingtième, Congo--Hergé's second Tintin adventure--didn't find its way into English until 1991. I've never seen the English translation for sale in U.S. shops, although I have seen it in French. In contrast, both English and French versions are easy to come by in the UK and Canada. Why is the English edition so scarce in the planet’s biggest English-speaking market? My best guess is that America's racial legacy, played out almost entirely on American soil, touches a rawer nerve than Europe's shame toward its own colonialism, carried on from a distance. In any event, the Congo was a big deal for Belgium, an also-ran among what Randy Newman parodies as the Great Nations of Europe. For the schizoid Walloons and Flemish, the Congo (their sole colony) was a font of riches (rubber, copper, diamonds, cobalt) and national puffery--a chip at the table of Europe for a nation made-to-order as a corridor for the French and German armies. In truth, Hergé's celebration of Belgian superiority and its mission to civilize was perfectly in step with his times. And while he eventually came to publicly regret having authored Congo, there's no denying his panache with caricatures of ethnic groups, including American Indians, Arabs, Jews, and Japanese. With that said, his virtues--vibrant, memorable characters; an infectious spirit of adventure; clean, vividly rendered drawings; and--yes--a strong moral center--make most of his work rewarding. Still, if you ever chance upon Tintin in the Congo in the presence of your kids, consider this blog post a warning label!